Sometimes, photographers are lucky enough to take a perfectly timed photo of an animal. This can sometimes result in truly breathtaking beautiful photos. Other times, it results in absolutely hilarious images! 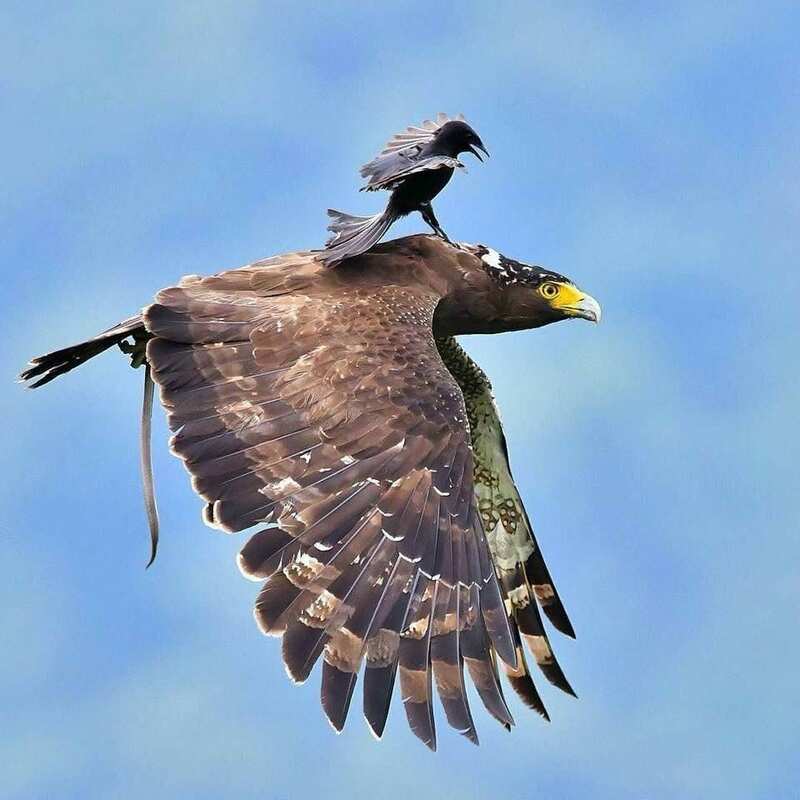 We’ve collected some perfectly-timed photos that are sure to make you do a double-take. These photos feature animals doing strangely human things. There are also photos of animals making side-splitting funny faces. 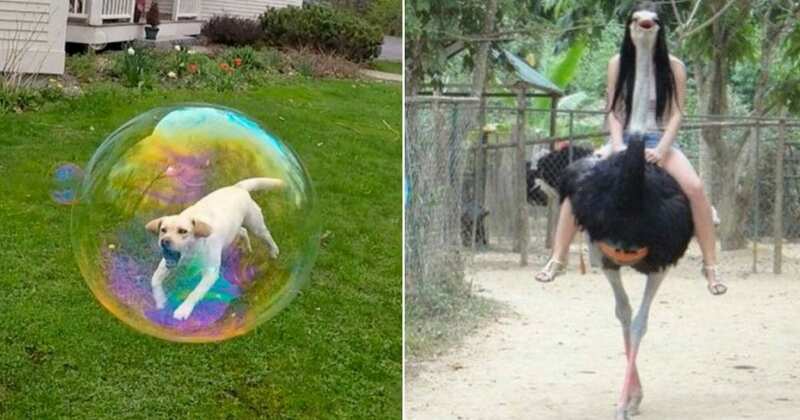 If you’re in need of a good laugh today, check out these amazingly timed animal images. These images are all sure to make you smile! We’re very impressed with this dog’s modeling skills. 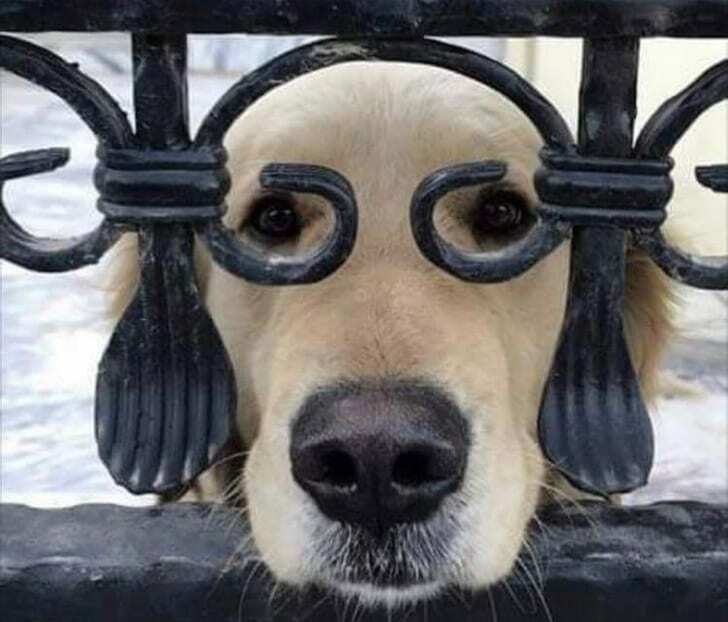 Look at the way he perfectly matched up his eyes with the iron fence. This dog provided his owner with the perfect photo, and we’re so glad his owner shared the image online for everyone to enjoy! This butterfly seemed to decide that this cat was a kind creature who wouldn’t hurt her. The butterfly gently landed on the cat’s nose, and the cat was confused but happy about the turn of events. 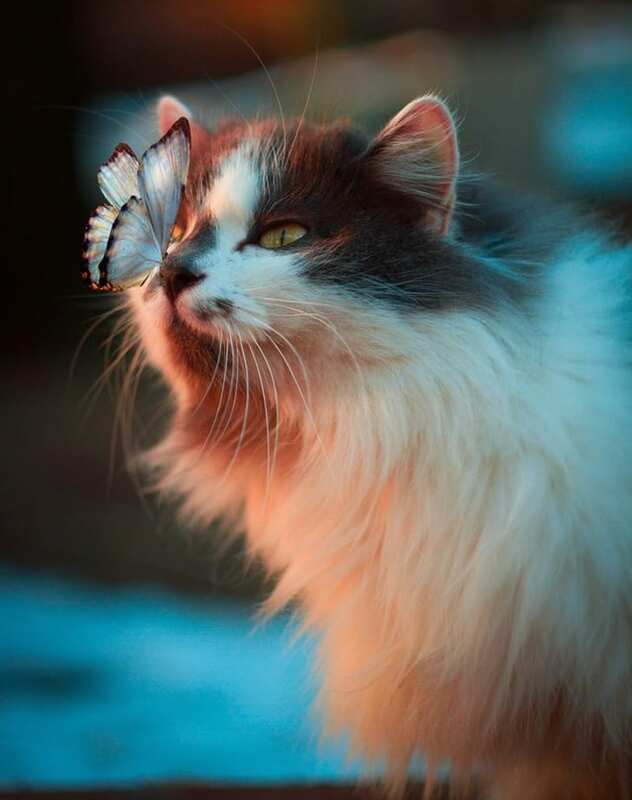 We love the serene expression on the cat’s face as he observes the butterfly. 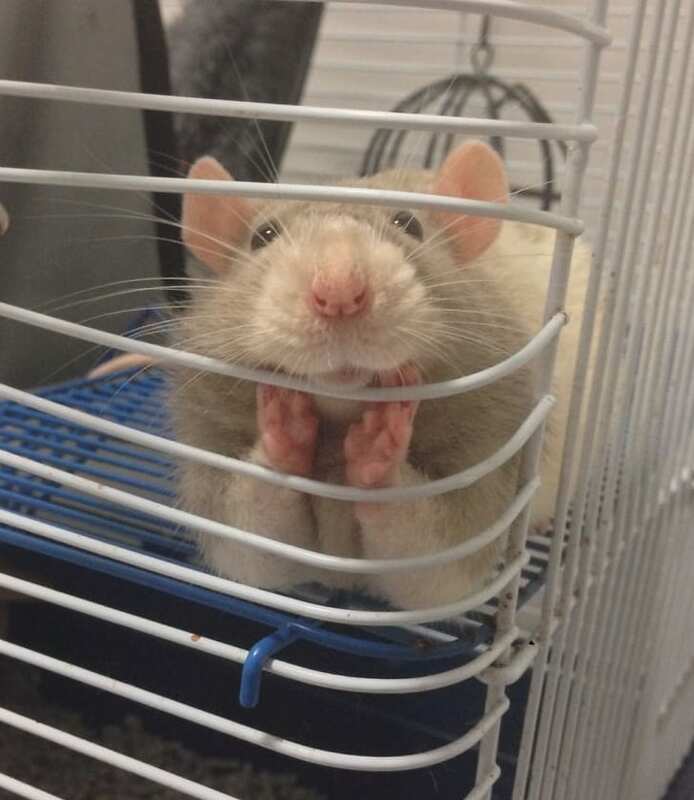 This rat looks like a great listener. Just look at the way he put his little hands on his chin—it looks like he’s saying, “Please, tell me more.” We’re sure this rat’s owner appreciates how good a listener her pet is. With a bit of forced perspective, this dog turned into a giant who has a taste for tractors! 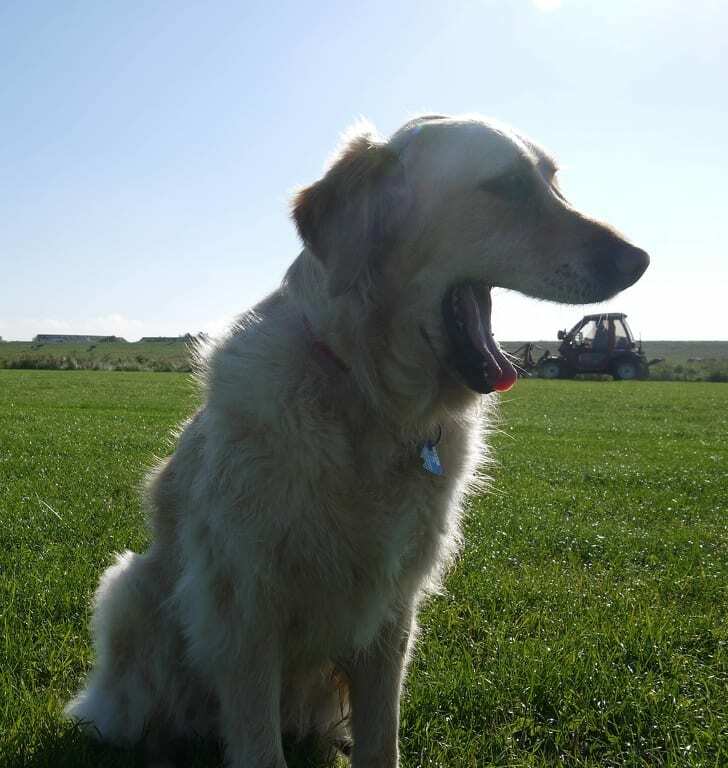 We’re impressed by the pup’s yawning timing—it’s like he knew his owner wanted to capture this photo. This photo will definitely make everyone do a double-take. 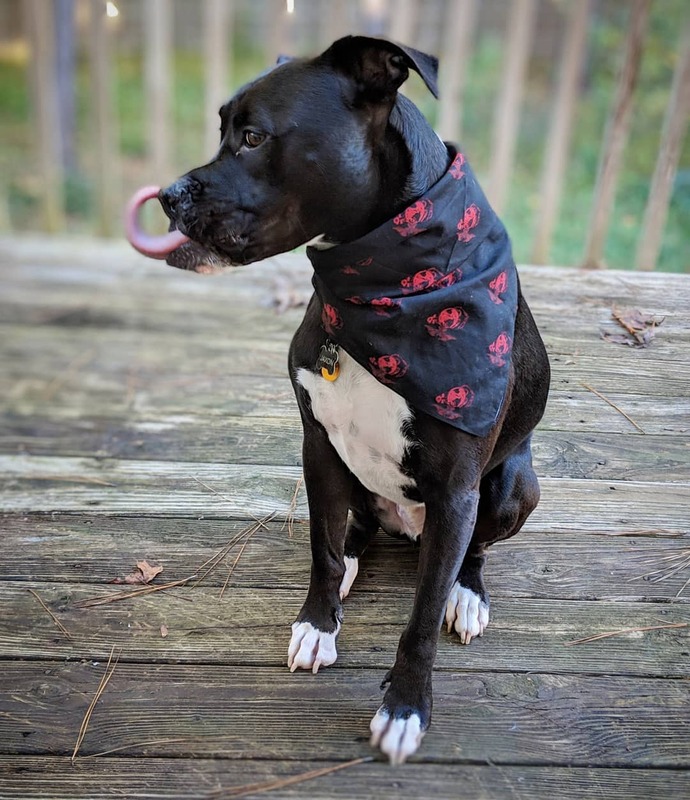 We’re very impressed by the way this dog can touch his nose with his tongue! We also love the way his tongue forms a circle—that definitely takes some skill to learn. Overall, this is one great photo that perfectly captures the dog’s impressive skill set. 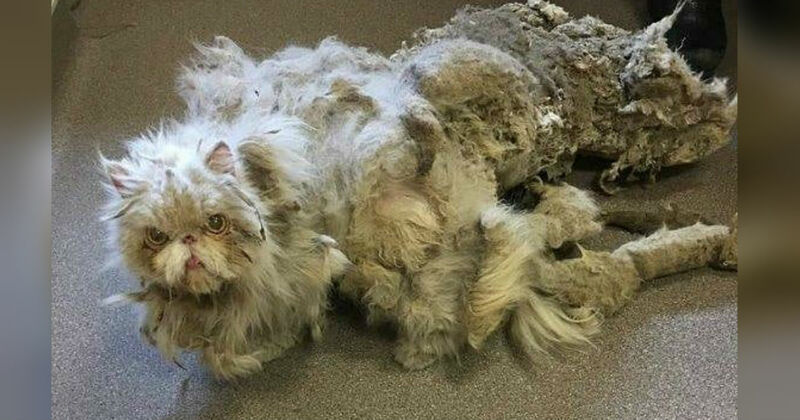 At first glance, it really does look like this cat has merged with the chair she’s sitting on. 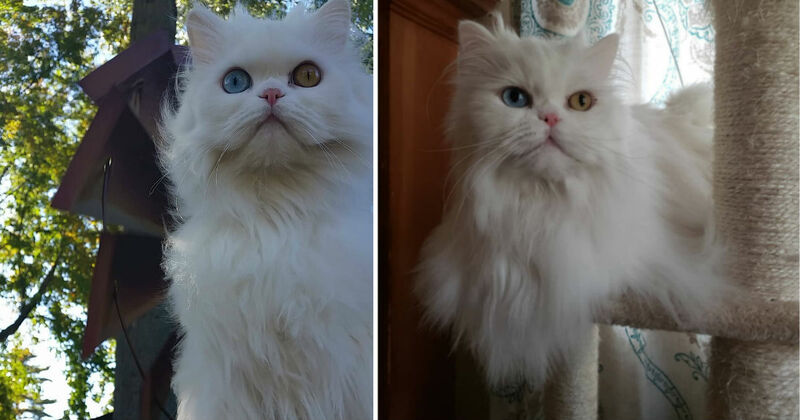 It’s almost like the cat knew she was posing for a photographer—even her facial expression is photo-worthy! 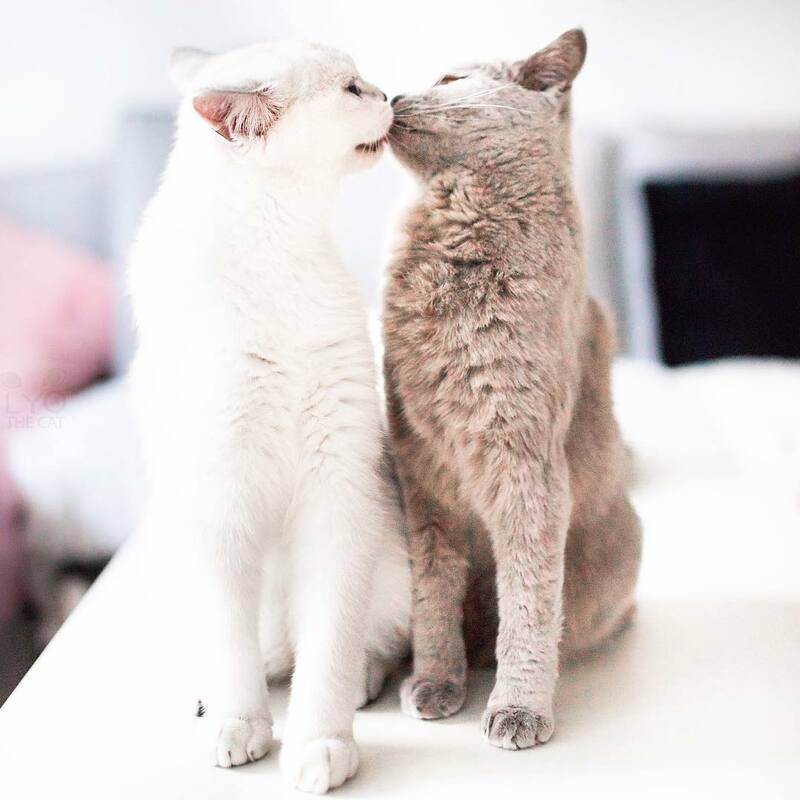 Here’s a photo that’s sure to make you ‘aww.’ These sweet cats love each other, and the photographer was able to capture the perfect moment of the two of them. We’re sure this photo will make you smile. Here’s a horse who knows how to take a good photo! 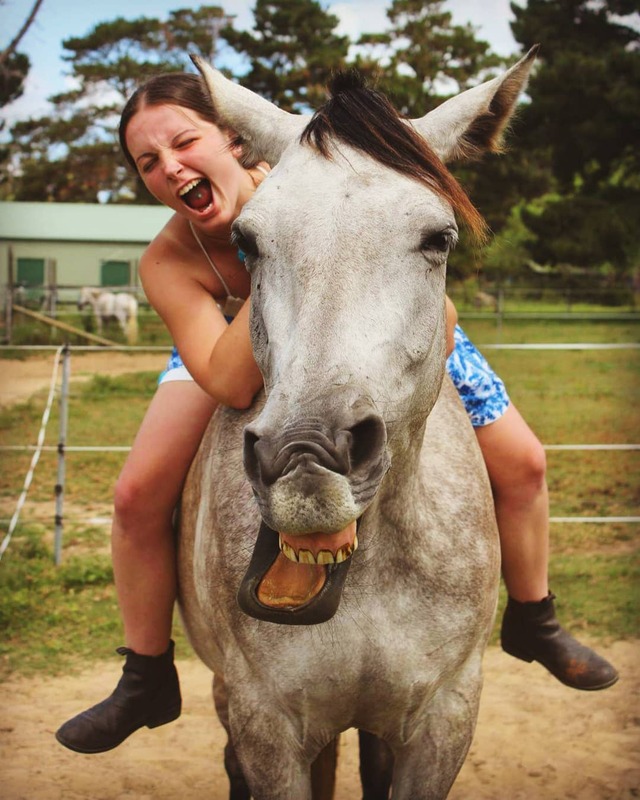 The horse has the best smile we’ve ever seen—it was so good, the girl riding on his back decided to mimic him. The result is an image that’s sure to make you laugh. We love everything about this photo, from the goofy expression on the falling dog’s face to the surprised expression on his friend’s face. 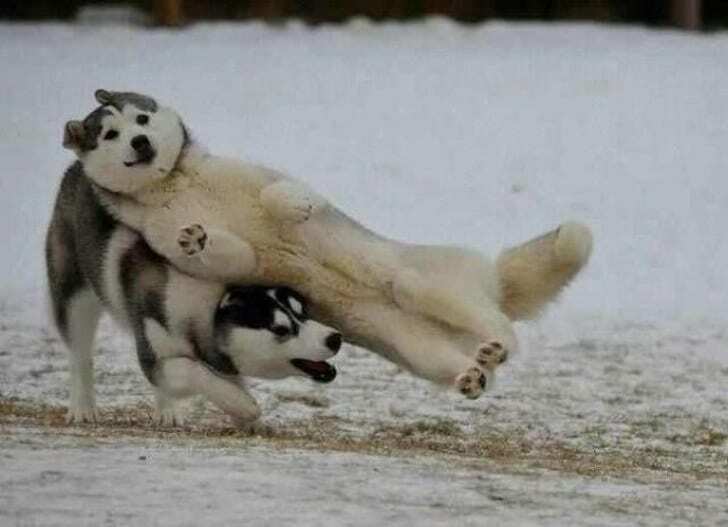 This Husky decided to do a real trust fall, and thankfully his friend was there to catch him. 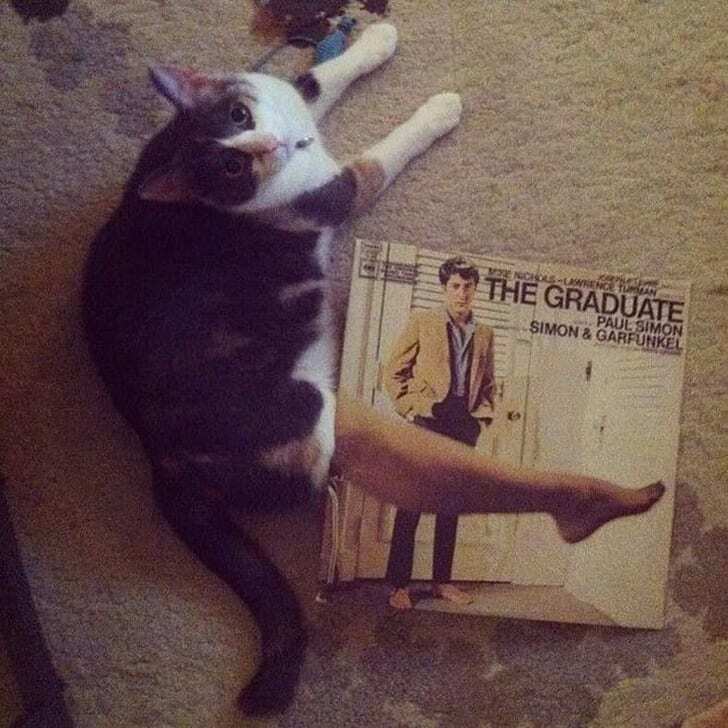 We’re amazed by the way this cat’s leg perfectly matches up with the Graduate album cover. The cat looks like she isn’t sure why her owner is laughing, but she seems to enjoy making her human smile. 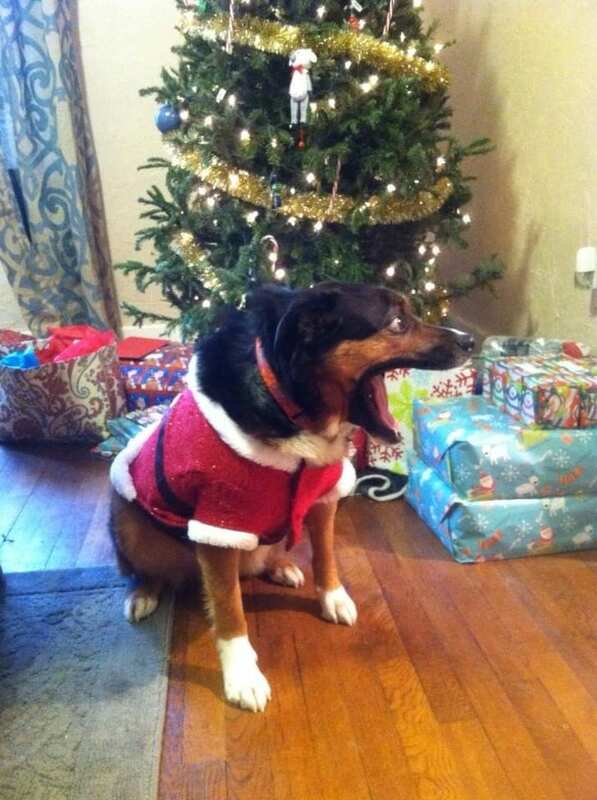 This dog’s owner managed to capture the moment their dog saw Santa Claus! Well, okay, maybe they didn’t see Santa himself, but they definitely saw something that surprised them. Either way, this is one great photo. You can tell the photographer worked hard to set up this shot, and it was worth it. 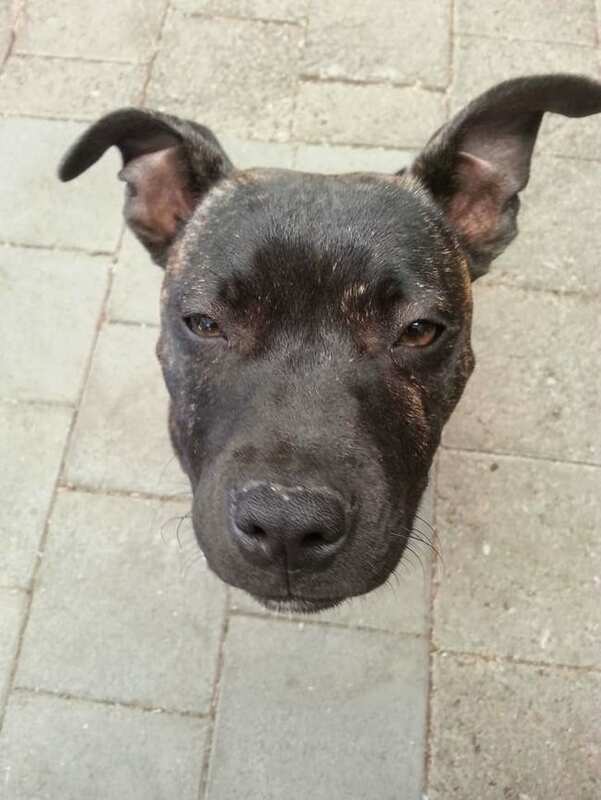 The photographer was able to get just their pup’s head in the frame, which made it look like the dog’s head is floating in space. It’s a bird, it’s a plane, it’s Super-dog! 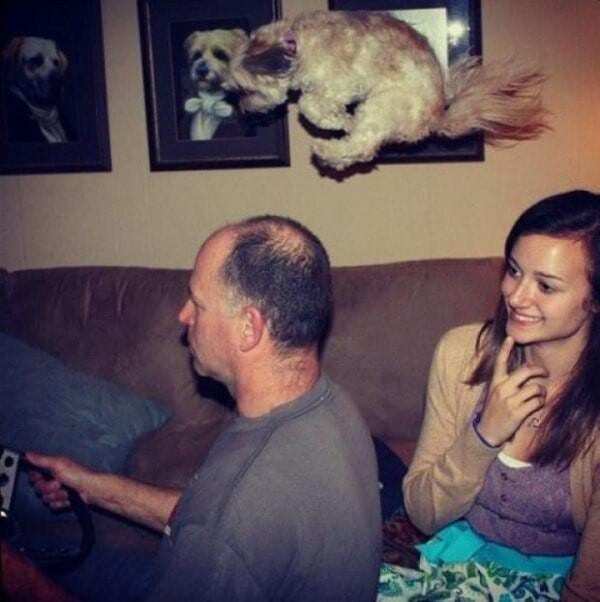 This dog’s owner got a photo of their dog mid-jump, resulting in a photo where it looks like the dog is flying. We’re very impressed with this photographer’s incredible shot. 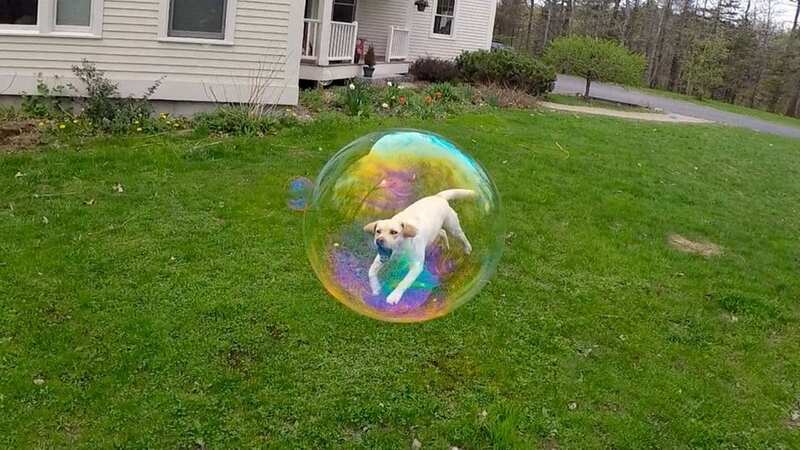 This little pup has a big problem: he’s trapped in a bubble! 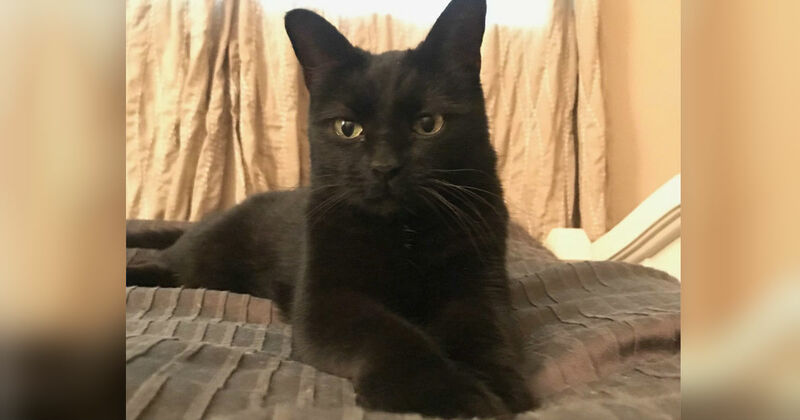 He doesn’t understand why his owner is taking photos of him instead of helping him, which is probably why he looks so worried. 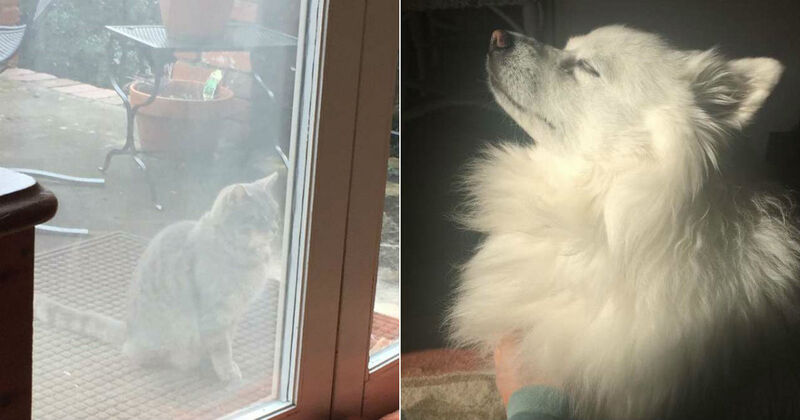 Hopefully, the dog’s owner will free their pup soon. This photographer got a truly once-in-a-lifetime shot of a whale about to breach the surface of the water. 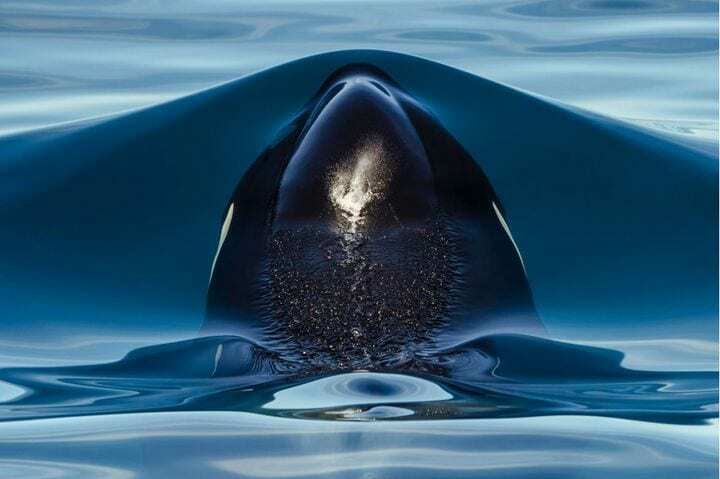 Everything about this photo is amazing, from the way the whale’s nose is gently touching the wave above it to the ripples of water around him. 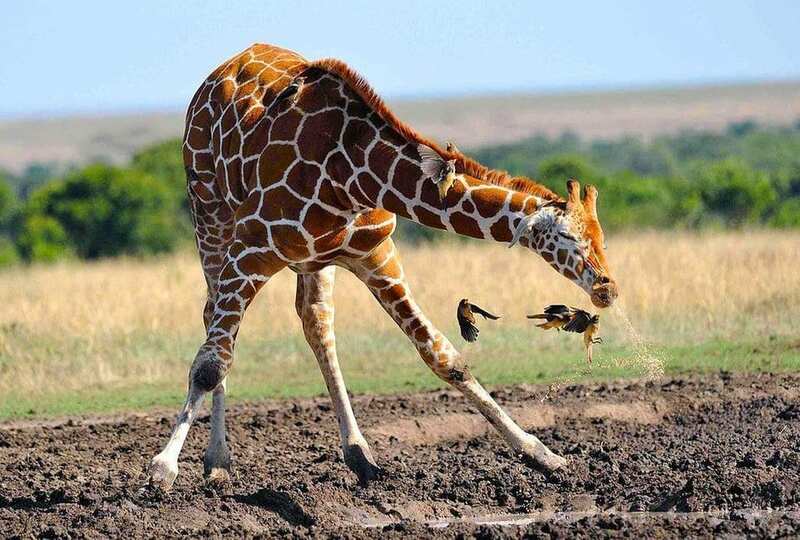 This giraffe sneezed so hard all the birds around him flew away! Hopefully, the birds said ‘bless you’ before they left. This hilarious photo is sure to bring a smile to your face. 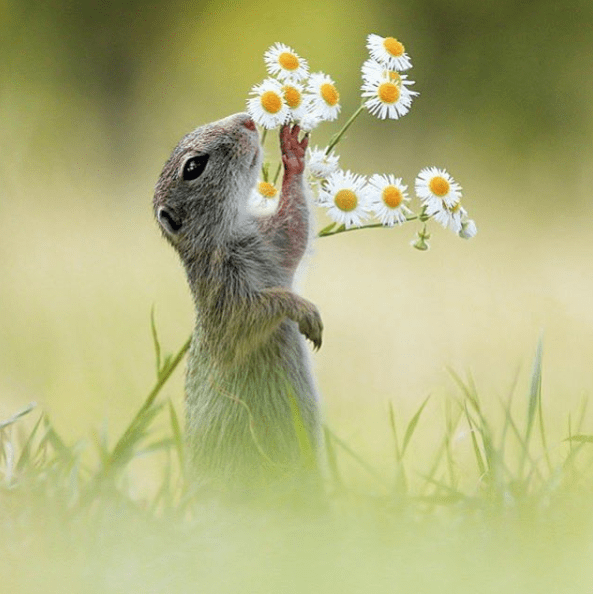 This prairie dog always makes time to stop and smell the daisies! We love everything about this photo, from the way the prairie dog is gently touching the flower to the happy little smile on his face. 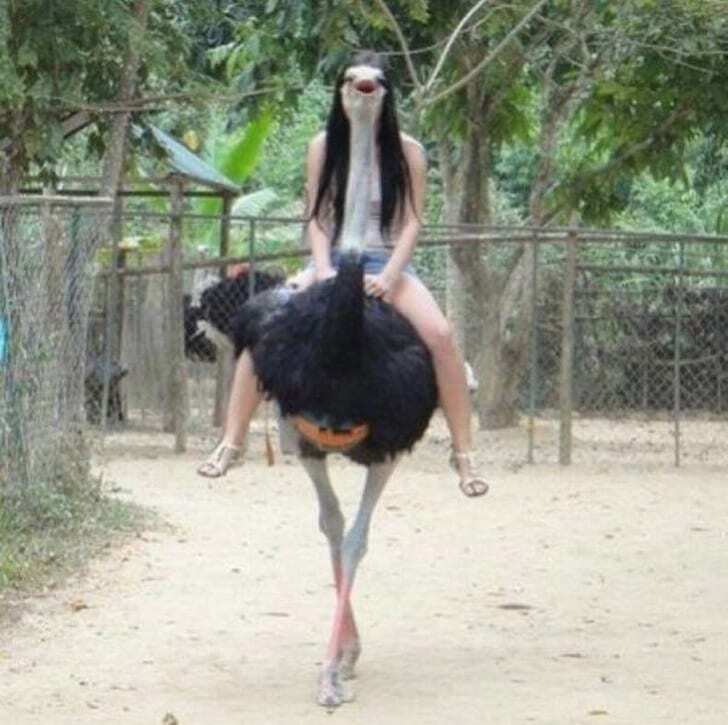 Here’s a real headscratcher of a photo: is this girl half-ostrich, or is the ostrich half-girl? Either way, this is definitely a photo that you’ll have to look twice at. Even after you look at it twice, it’s still a bit confusing! 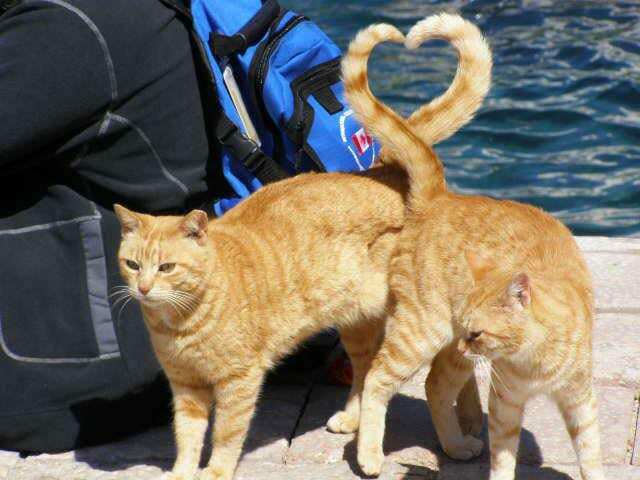 These cats decided they wanted to touch tails, and in doing so they unintentionally created the perfect heart! This photo is sure to make everyone’s heart melt. 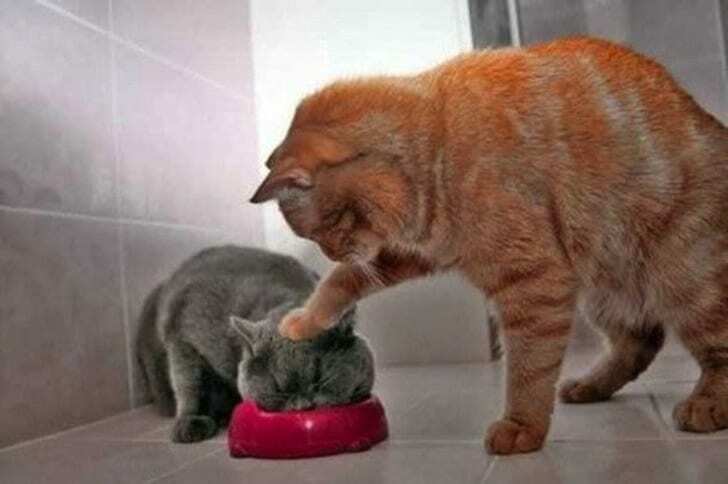 This ginger cat is very worried about her friend not eating enough food. She wants to make sure her friend is getting enough to eat, and so she decided to push the gray cat’s head down. The gray cat doesn’t seem bothered by her friend’s pushiness. 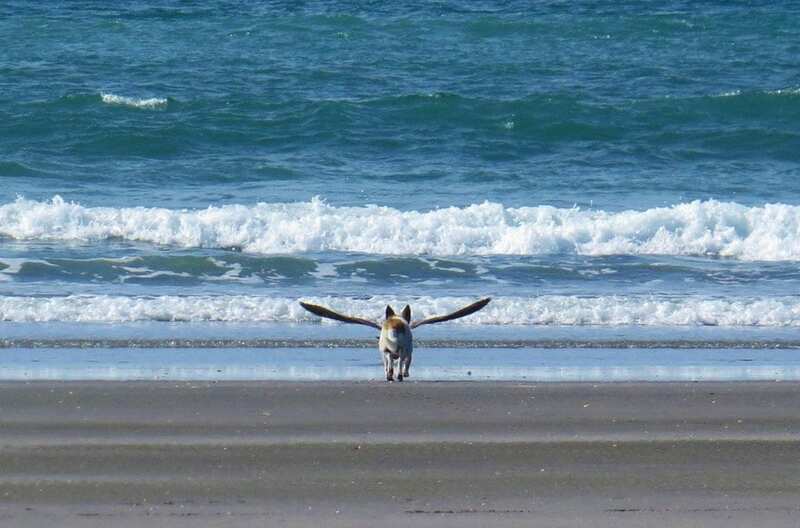 This dog is ready to spread his wings and fly. The pup has chosen a very scenic spot for his flight—we’re sure he’ll have a great time soaring over the ocean. 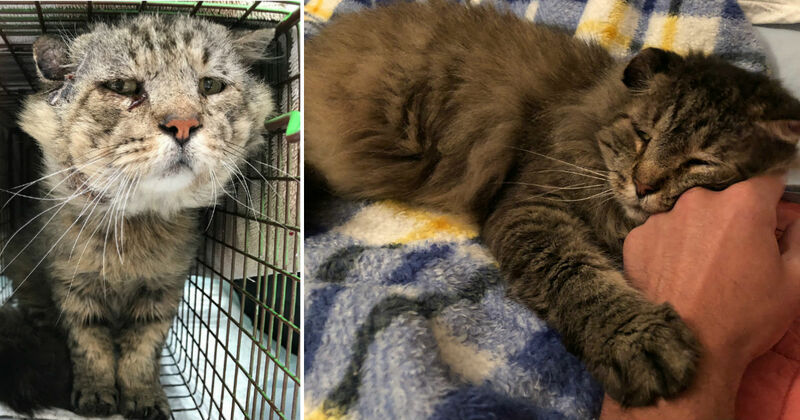 Hopefully, he comes back to his beloved human once he’s finished with his flight. 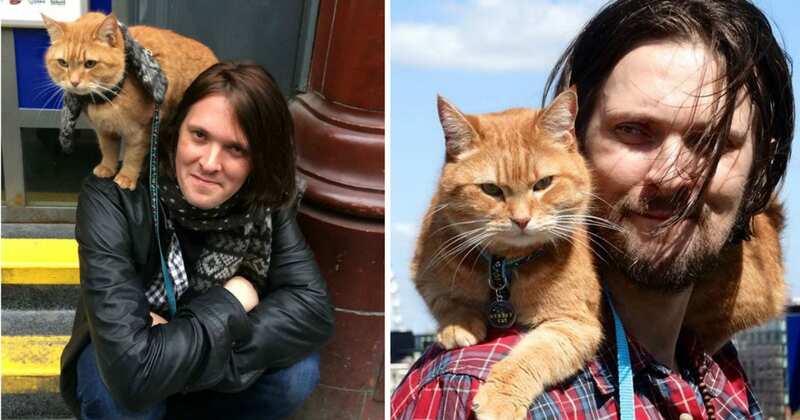 It seems like this cat realized that he looks very similar to the cat on the Meow Mix bag. 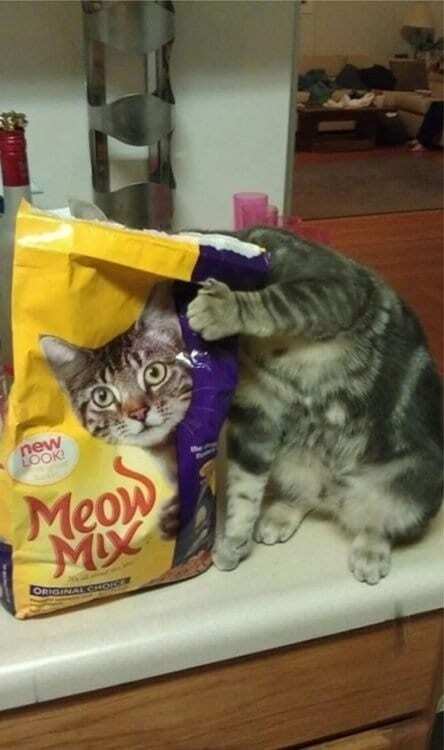 Just look at the way he perfectly hid his head behind the bag—it’s like he knew he was setting up his owner for a great photograph. 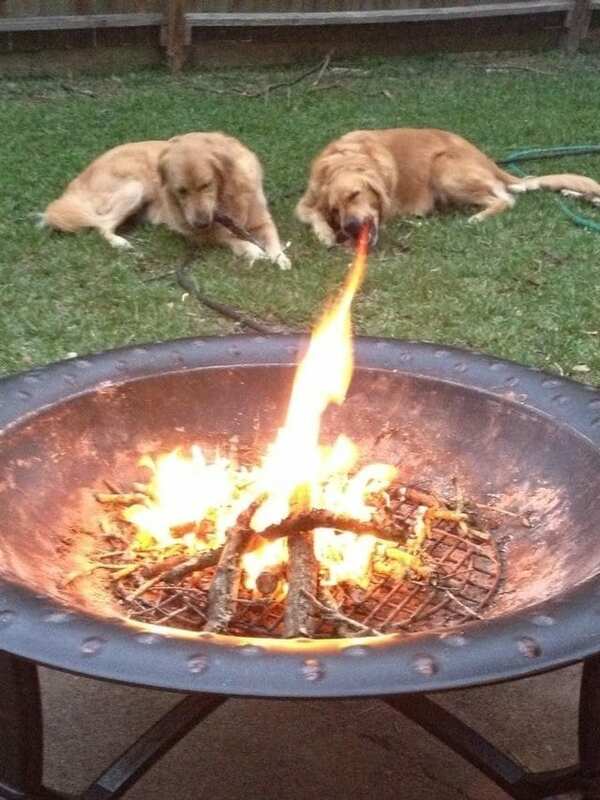 This dog must be part dragon—it’s the only explanation for the way he’s able to shoot fire out of his mouth! The other dog looks surprisingly blasé about his friend breathing fire. This must not have been the first time the dog showed off this trick. We’re curious what the photographer said to get all 30 of these dogs to look at her at the same time. 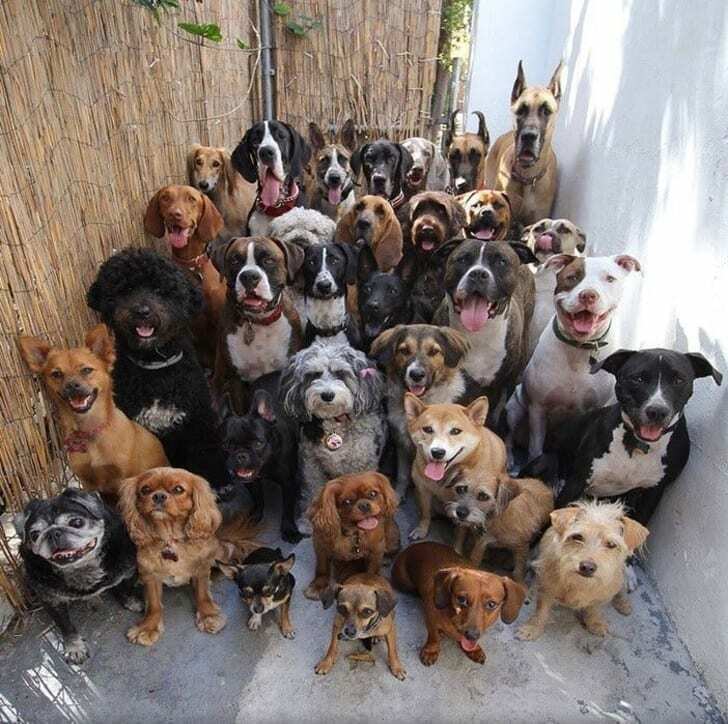 Did she say, “It’s time to eat?” Or, did she simply shout, “Squirrel!” Either way, this photo is incredible—it’s not too often you get such a perfect photo of so many adorable pups. 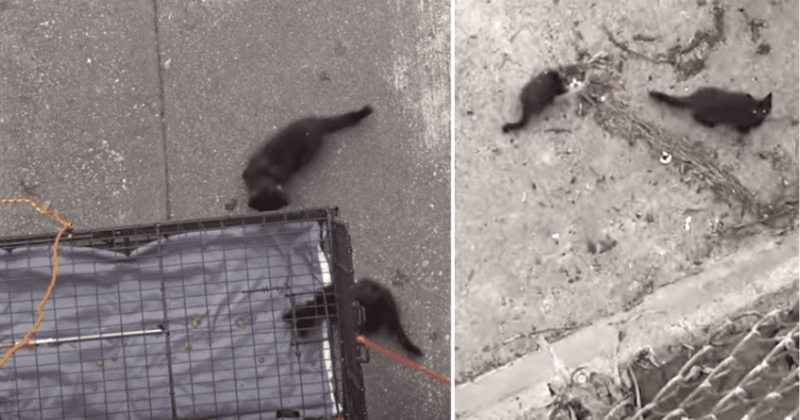 It looks a whole lot like these cats are ballroom dancing together on this driveway! 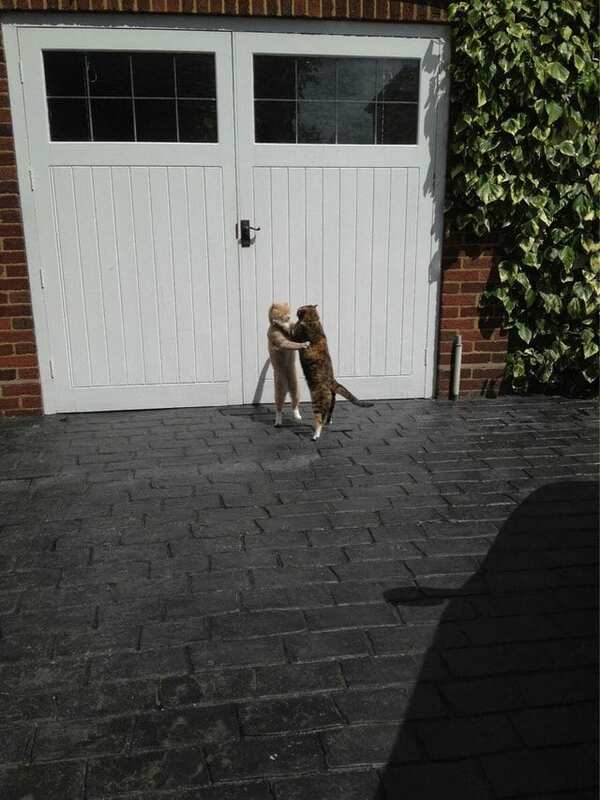 The photographer said that in reality, the cats were actually fighting, but we’d like to believe that the cats were really just doing a complicated dance routine together. This German Shepherd is modeling the latest fashion trend: dog hats. 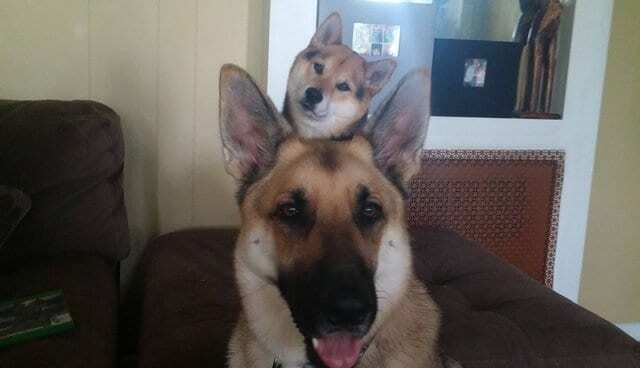 This dog hat looks incredibly realistic—if we don’t know better, we’d think it was a real dog hiding behind his friend! 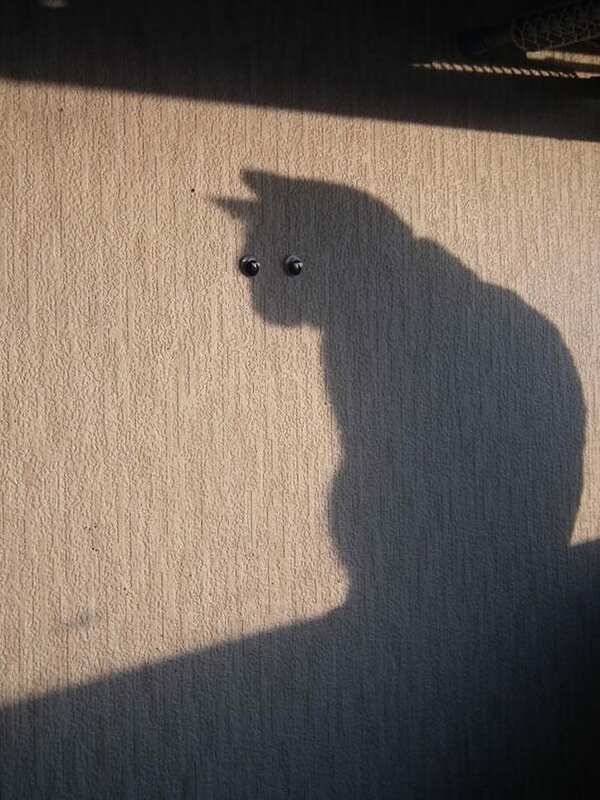 When this cat’s owner saw their kitty’s perfect shadow on the wall, they couldn’t help but attach googly eyes to the wall! The result is a great photo that we can’t stop laughing at—we just love the way the googly eyes add humor to the image. 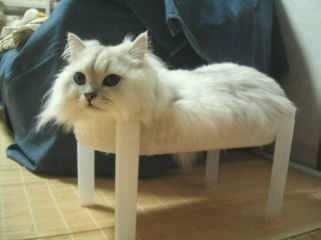 Meet the bionic cat: half kitty, half…stool? 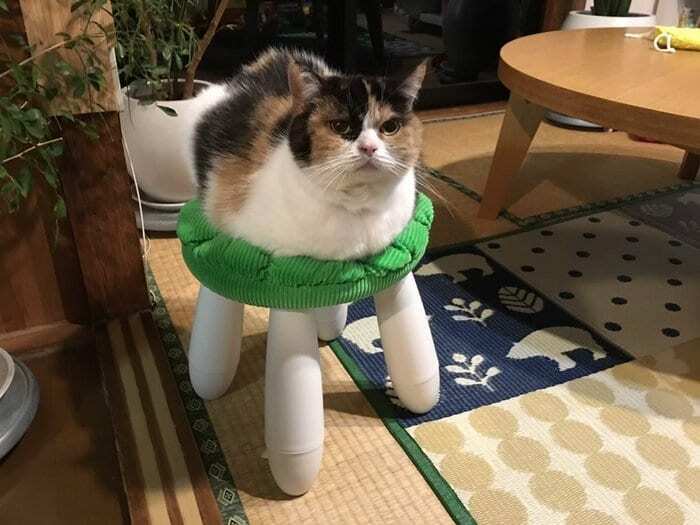 Okay, maybe the cat isn’t really half-stool, but it sure looks like it in this photo. And either way, this is one hilarious image. This photographer’s dog was curious about the bubbles floating past them, and they decided to nibble at them. 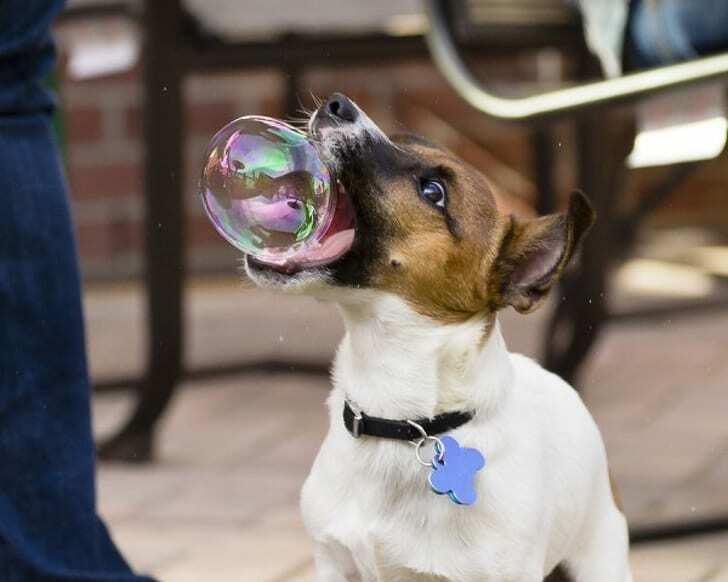 The photographer was able to capture the exact moment their dog bit into a bubble, and the resulting photo is great. 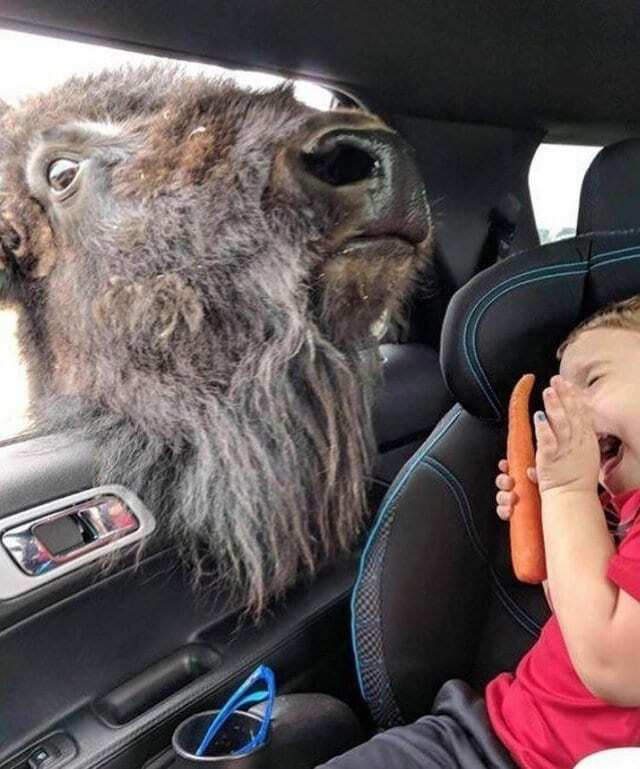 This bison just wanted to say hello to this little boy and maybe nibble on the carrot he was holding. But the little boy wasn’t expecting the bison to get so close, and he was naturally a bit shocked. Hopefully, the two were able to become friends in the end. 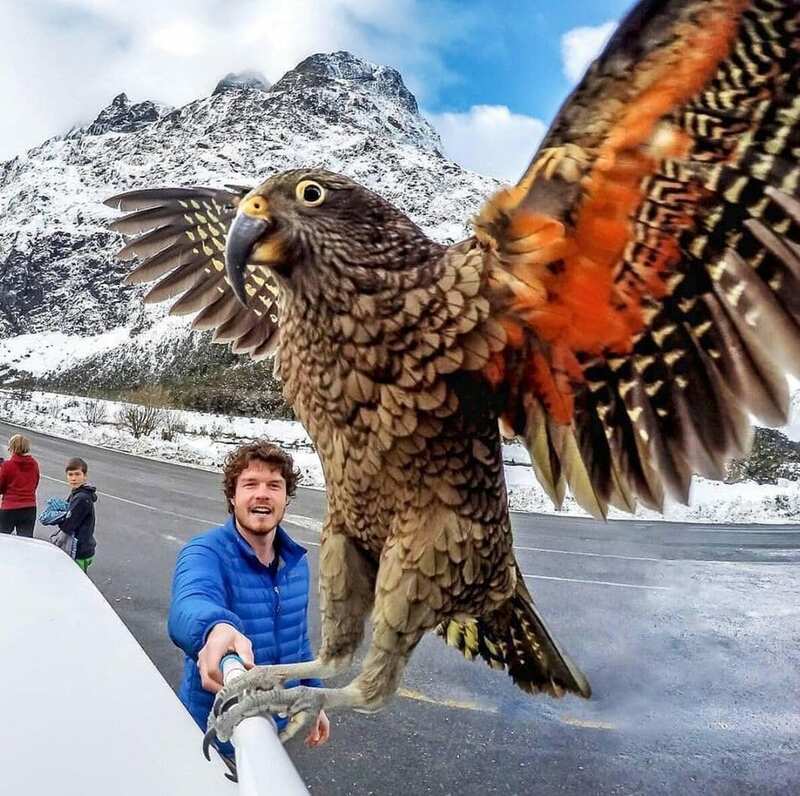 When this Kea parrot in New Zealand saw a tourist taking a selfie, the bird decided that she wanted to join in. 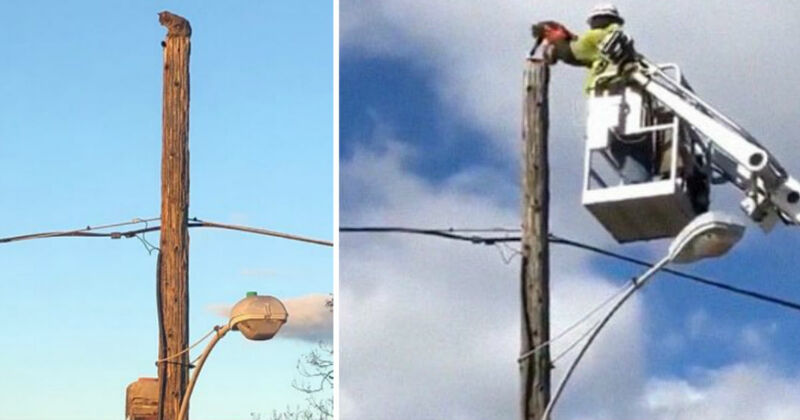 The man taking the selfie was a bit shocked, but we’re sure that he loved the photo when he saw it! This Mobula Ray decided that he was tired of spending all his time in the water, and he wanted to see what life was like on the surface. 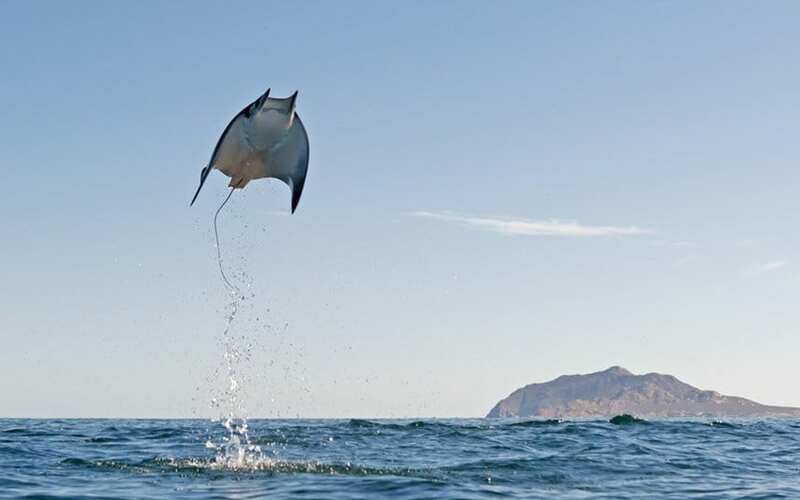 So, the ray jumped into the air, just as a photographer took a photo of him. The resulting photo makes it look like he’s about to soar off into the sky. Here’s another little animal who turned into a giant with forced perceptive! 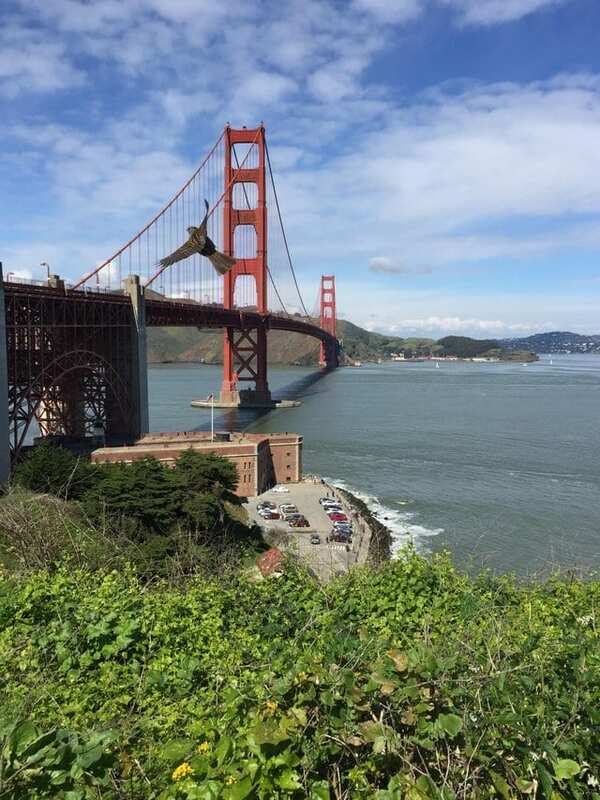 This bird happened to be flying by the Golden Gate Bridge at the right moment, and the photographer was able to capture a great shot of them. 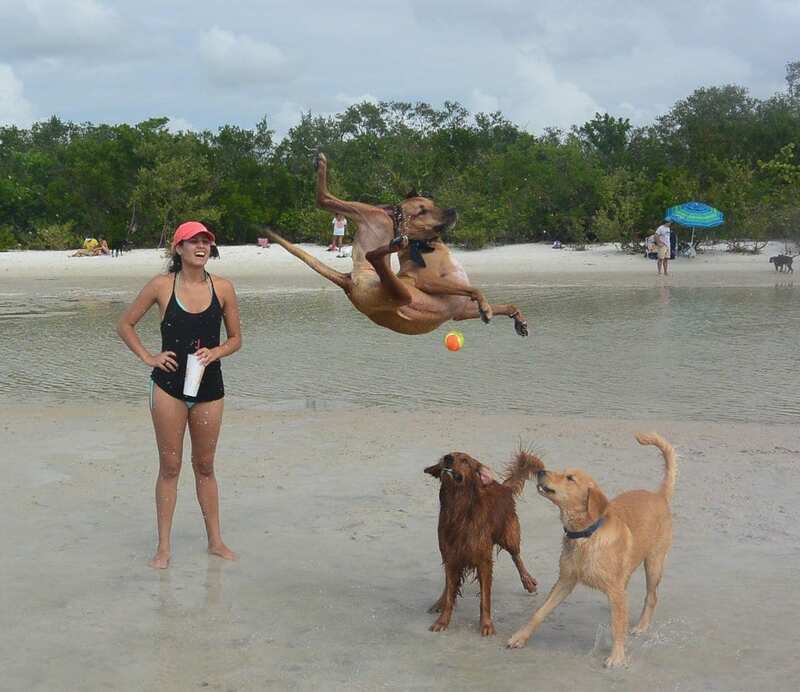 This dog went to catch a ball and ended up doing an incredible mid-air gymnastics routine. As you can see in the photo, the dog’s friends and his human were all very impressed by his moves! The dog looks like he’s in complete control of the situation. 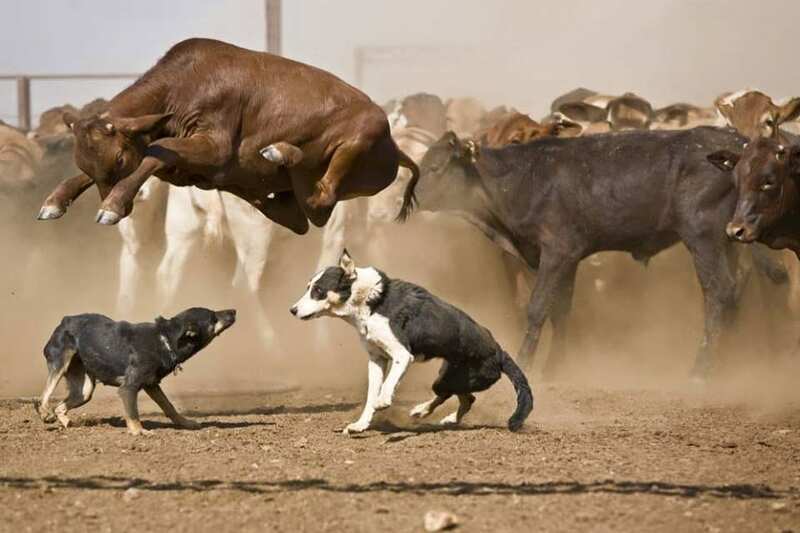 This brown cow showed that cows can jump incredibly high when they want to. Both of the dogs look very shocked about this turn of events—they weren’t expecting to see a cow floating above their head. These hilarious photos all show the importance of timing in photography. These photos were all taken at the exact right moment, resulting in some funny and beautiful images! These photos are sure to make you smile.